Instead of ordering takeout, discover how easy it is to make your favorite Asian-inspired dishes at home! 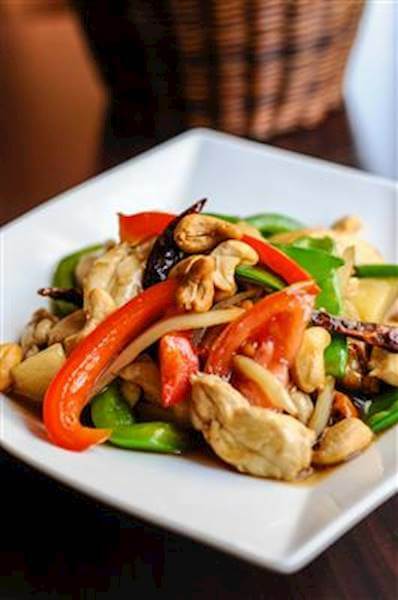 Consider this recipe for cashew chicken cooked with peppers, scallions, and flavorful spices. The savory sauce complements the chicken beautifully and the cashews give the dish a satisfying crunch. RecipeSavants.com Instead of ordering takeout, discover how easy it is to make your favorite Asian-inspired dishes at home! Consider this recipe for cashew chicken cooked with peppers, scallions, and flavorful spices. The savory sauce complements the chicken beautifully and the cashews give the dish a satisfying crunch. Smart Recipes, Chinese Recipes, Chicken Recipes, Recipes Chicken Chinese Cashew Chicken PT30M Serves 4 Ingredients: 1 Pound Boneless, Skinless Chicken Thighs 3 Medium Serrano Peppers 0.75 Cup Orange Juice 0.33 Cup Clover Honey 0.25 Cup Soy Sauce 1 Tablespoon Cornstarch 1 Teaspoon Fresh Ginger 1 Teaspoon Garlic Salt 1 Teaspoon Freshly Ground Black Pepper 2 Tablespoon Vegetable Oil 0.5 Large Bunch Of Scallions 2 Medium Bell Peppers 1 Cup Roasted Cashews 0.25 Cup Dried Red Chilies 1 Large Tomato In a medium bowl, whisk honey, orange juice, soy sauce, cornstarch, garlic salt, ginger and pepper until combined. In a wok, heat 1 tablespoon of oil and stir -fry peppers, chilies, and tomatoes until just tender, about 5 minutes. Set aside. In the same wok, heat remaining oil and brown chicken and stir frequently until completely cooked, about 10 minutes. Stir in cashews, vegetables, and sauce and stir-fry until the sauce is thickened. Serve over steamed rice.